On 31 August, Sobesednik offered a not-altogether-serious, but nonetheless-interesting psychological portrait of Defense Minister Anatoliy Serdyukov . . . the magazine interviewed an expert in nonverbal communication and microfacial expressions, a specialist in physiognomy, a professional image consultant, a handwriting analyst, and, yes, a numerologist. Of course, these observers had the advantage (or perhaps disadvantage) of knowing at least a little something about their subject, his reputation, and style beforehand. The nonverbal and microfacial expert said Serdyukov’s restrained smile and concentration are most characteristic of his expression. He looks as if he’s suffering over the resolution of some problem with knitted brows, and he’s a man of few words. His external appearance and pudginess suggest he senses and feels more than he hears or sees, and he likes both physical and psychological comfort. According to this observer, there’s nothing that bespeaks talent or charisma in Serdyukov, but he does exude efficiency and discipline. 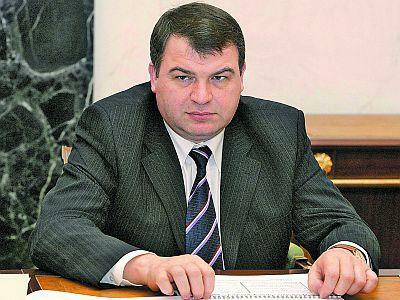 The physiognomy expert says Serdyukov’s round and soft appearance are characteristic of a peacetime military man. A man occupied with logistical issues, who knows how to set goals and achieve them. A businessman or administrator, not a wartime leader. His crooked brows and wrinkled forehead attest to difficulties in government service; it would have been easier for him in business. A sharp visage compensates for his external softness. His mouth is narrow; he is no orator. However, his correctly formed ears connote someone who listens to information and the opinions of others. The image consultant notes Serdyukov practically never wears military attire. He prefers his civilian clothing, and avoids ingratiating himself with the uniformed military. His suits are conservative and classic. He’s a restrained and severe man. He can be somewhat aggressive (shown by the broad contrasting stripes on his ties). Such people are usually burning to reform things and implement their ideas and goals, no matter what. The handwriting analyst says Serdyukov’s handwriting indicates his concrete way of thinking, and tactical planning. He has a great sense of his own importance. The pinching, arc, and intricacy of his letters show palpable internal emotion and willfulness, but other features indicate he’s inclined to self-control. The constant requirement to control himself and hold his emotions is externally expressed as tension and restraint. Using Serdyukov’s birth date, the numerologist produced a number to reveal his character — 811962279112. Four 1’s means he’s likely to be military, severe, and direct. But the absence of 5’s means he has weak intuition and his actions are sometimes illogical. In all seriousness, it’s pretty easy to laugh all this off since Serdyukov’s a well-known public figure, but recall The Atlantic article describing Brenda Connors’ analysis of then-President Vladimir Putin’s gait, and how it explains his character and behavior. So Serdyukov’s a bit repressed. In fairness, one probably shouldn’t expect any Defense Minister (or any minister for that matter) to be a happy man or woman. This entry was posted in Command and Control, Military Leadership, Serdyukov's Reforms and tagged Anatoliy Serdyukov. Bookmark the permalink.